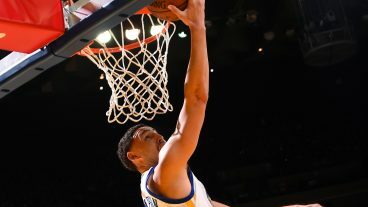 The Golden State Warriors defeated the Indiana Pacers 142-106 at Oracle Arena on Monday. Klay Thompson scored 60 points in 29 minutes and led the Warriors (18-3) to an incredible rout of the Pacers (10-11) to grab their ninth home win of the season. The remarkable scoring effort started early and had Oracle Arena rowdy for the three quarters of play in which Thompson dominated from every square inch of the court. Golden State racked up 80 points by the half, and took a 30 point lead into the third quarter, where Thompson added 20 more points to the 40 points he scored in the first half. The Pacers simply had no answer for Thompson, even when they finally switched Paul George onto the hot shooting guard after he broke the 50 point mark. Thompson’s final line was 60 points, two rebounds and one assist 21-of-33 shooting including 8-of-14 from behind the arc and 10-11 from the free throw line. Kevin Durant added 20 points, eight rebounds and four assists on 14 shots, while Stephen Curry scored 13 points on 2-of-7 shooting from deep. As for the Pacers, the game was out of reach from midway through the second quarter, and the defensive effort and game play focuses on Curry and Durant. Paul George led Indiana with 21 points, 10 rebounds, three assists and one steal on 4-of-12 shooting.